Stanford Advanced Materials (SAM) offers thulium fluoride powder and other rare earth compounds with competitive price. Thulium fluoride is a white powder with no odor, insoluble in water. It is a water insoluble Thulium source for use in oxygen-sensitive applications, such as metal production.Thulium Fluoride has specialized uses in ceramics, glass, phosphors, lasers, also is the important dopant for fibre amplifiers and as raw materials for making Thulium Metal and alloys. 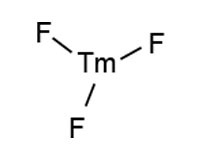 Thulium Fluoride is a water insoluble Thulium source for use in oxygen-sensitive applications, such as metal production. Fluoride compounds have diverse applications in current technologies and science, from oil refining and etching to synthetic organic chemistry and the manufacture of pharmaceuticals. Our products are clearly tagged and labeled externally to ensure efficient identification and quality control. Great care is taken to avoid any damage which might be caused during storage or transportation.